Smarter contextual awareness, 4K video and augmented reality are just some of the new technologies that will be offered by smartphones and tablets over the next year or so, according to Qualcomm's product blueprints. Qualcomm is planting the seeds for these technologies in mobile devices by loading its chips with new wireless connectivity, computing, sensory and graphics features, said Keith Kressin, vice president of product management at the company. The company's goal is to make mobile devices intelligent, aided by chips that behave like silicon brains to provide better awareness of and perspective on location and surroundings. Qualcomm's ambitious mobile plans are best highlighted in the high-end Snapdragon 810 64-bit chipset, which is the company's fastest mobile processor. The Snapdragon 810 has new low-power DDR4 memory, multigigabit WiGig wireless data transfer capabilities, multicarrier LTE aggregation and a new graphics engine. The new technologies pave the way for mobile devices to become 4K video hubs, and ultimately could improve human interaction with smartphones and tablets. With WiGig, the Snapdragon 810 could also eliminate ports and wire clutter. Features from Snapdragon 810, which is targeted at premium mobile devices, also could trickle down to chips used in lower-priced devices, Kressin said. Qualcomm has no doubts that the chip will appear in smartphones, according to Kressin. "We're not just making this chip for a bunch of tablets," he said. 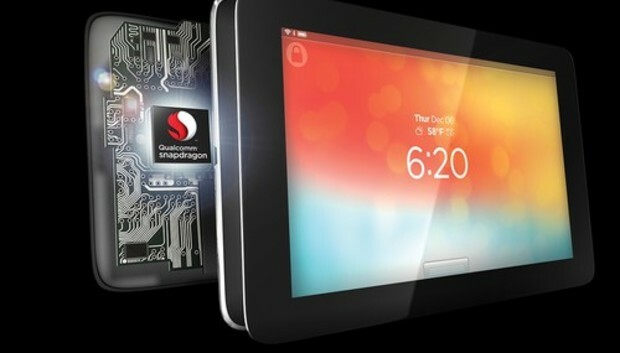 Mobile devices with Snapdragon 810 will begin appearing in the first half of next year, according to Qualcomm. Snapdragon chips are used in handsets with Android and Windows Phone, which are not yet available with 64-bit chips. The Snapdragon 810 has technologies to allow mobile devices to shoot, process, store, play and wirelessly transmit 4K video to external displays, Kressin said. Mobile devices will be able to wirelessly stream video to TV sets at up to 7Gbps (bits per second) through WiGig wireless data transfer technology. TVs and other consumer electronics incorporating WiGig, which is faster than Wi-Fi and LTE, will ship in the second half next year. WiGig could also spell the end of HDMI ports in mobile devices and eliminate wires otherwise required to transfer data to external storage devices. Users could shoot video more than the 4K resolution through the Snapdragon 810's support for cameras up to 55 megapixels. However, device makers will decide on the camera resolution in mobile devices, Kressin said. A number of technologies in the 810 could also bring augmented reality and virtual reality to mobile devices, Kressin said. Real-world information can be captured through cameras, GPS and other location sensors, and then blended into interactive virtual environments. "The underlying foundation is there to support that usage model," Kressin said. Augmented reality and 4K video could be power hogs, but Qualcomm has added a bevy of new technologies in the 810 to balance power and performance, Kressin said. New LP-DDR4 memory will allow programs to run faster while consuming less power. The memory provides a faster pipe so more tasks can be executed concurrently. "Because of LP-DDR4, it's much more power efficient," Kressin said. "We really need to look at every aspect of the system to lower power." Kressin also envisioned 4K video transfers over cellular networks. The Snapdragon 810 has an integrated LTE modem with transfer speeds of up to 300M bps (megabits per second) that can aggregate data transfers from three carriers. That effectively provides more lanes in which to upload or download data over cellular networks. So far, Qualcomm competitors have shown aggregation from only two carriers. "Because service providers have different combinations of bands and bandwidths, this flexibility improves the likelihood that users can take advantage of these higher data rates," said analyst Linley Gwennap of the Linley Group in a research note earlier this year. Qualcomm also has the lofty goal of giving mobile devices a "digital sixth sense," with the ability to monitor air and food safety. In addition, the company also wants to blend data collected from cameras, sensors and wireless networks for social networking and targeted location services. Qualcomm has the resources and research capabilities to drive advances like LP-DDR4 and make them mainstream, said Nathan Brookwood, principal analyst for Insight 64. The Snapdragon 810 could be used in high-end and mid-priced phones, which are doing well in the U.S. But buyers in China are gravitating to low-priced devices, so the success of the chip in that market remains an open question, Brookwood said. Qualcomm is also facing competition from rivals like Mediatek and Allwinner, which supply chips for lower-priced devices, but are "moving up the food chain," Brookwood said. "Mediatek should not be underestimated, but Qualcomm is clearly the leader in technology," Brookwood said. Ultimately, with smartphones and tablets becoming more capable, the need for new technologies is only growing, Kressin said. "There's a long line of pretty innovative things coming," Kressin said. Mingis on Tech (Apple edition): To iPhone 7 or not? Mingis on Tech: Sierra, Siri and Pokemon, oh my!